Pickerel Frog image by Brian Gratwicke, cc-by-2.0, found on Wikipedia. The Pickerel frog, Lithobates palustris, is unique among North American frogs. Common in the clear, cool ponds and streams of the northeastern and eastern United States and Canada, as well as the coastal swamps and marshes of the south, the Pickerel Frog is plentiful in the wild. In fact, International Union for Conservation of Nature lists the Pickerel frog as a species of “least concern”, indicating that there is no threat to the existing population. The medium-sized brown-spotted frog may look unassuming, but this species of frog differs from other North American frogs is several significant ways. Perhaps the most unique feature of the Pickerel frog is the toxic secretions it releases when it feels threatened. This makes the Pickerel frog the only poisonous frog that is native to the United States. The skin on the frog’s back oozes the poisonous secretion that is irritating to a predator’s skin at its mildest and deadly at it strongest. The toxin is strong enough to kill some of the frog’s predators, like snakes or small mammals. 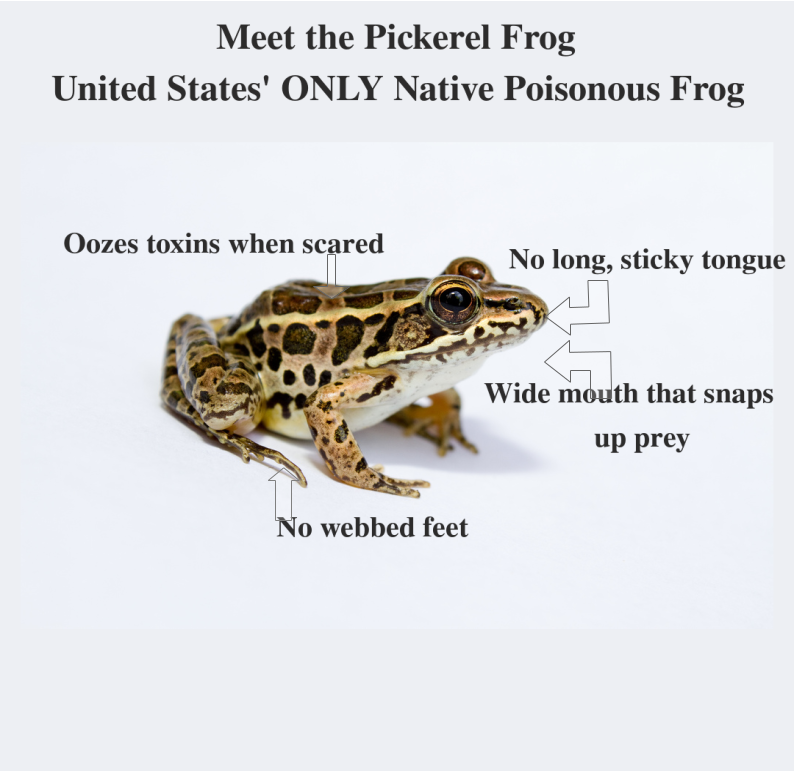 For humans, the poison is only mildly irritating if one were to unknowingly pick up a Pickerel frog. 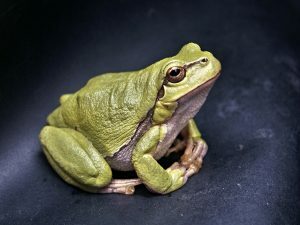 Most animals have figured out that it is best to just leave the Pickerel frog alone, but a few of its amphibian predators, such as the bull from and the green frog, have developed immunity to the poison. Although poisonous frogs are common in other parts of the world, such as the rainforests of South America, the Pickerel frog is North America’s only poisonous frog. Pickerel frogs do not have webbed feet like most other frog species. This is rather unusual since the frog is semi-aquatic and spends a lot of its time in a watery habitat. Scientists believe that this evolutionary adaptation helps the frog move more easily on land so that it can avoid predators. It is, apparently, able to swim just fine without the webbing between its toes. Another odd feature of the Pickerel frog is that the species lacks the long sticky tongue that other frog species use to catch insects. Most frogs have this extra long tongue and it can shoot out quickly to snag its prey…a passing fly or gnat. The Pickerel frog, like other frogs, eats a diet of mostly insects, but it relies on another method to capture its meals. The Pickerel frog has a very large mouth. It hunts, mostly at night, by staying perfectly still until its prey comes close to it. Then, the frog will quickly catch it in its mouth and gobble it down in one bite. The mouth of a Pickerel frog is so wide, in fact, that it can swallow an animal nearly the same size as its own body. This included caterpillars, snails, tadpoles, other frogs, spiders, and beetles. The Pickerel frog is often mistaken for the northern leopard from and, indeed, these two species of frogs closely resemble each other. The easiest way to tell these two amphibians apart is to examine the spots on their backs. The spots on the northern leopard frog are circular in shape, while the Pickerel frog’s spots are shaped more like irregular rectangles. Pickerel frog got their common name because fisherman used the frog as bait to catch pickerel, a long fish that belongs to the pike family. The pickerel, it seems, is also immune to the toxins produced by the Pickerel frog. The scientific name for the Pickerel frog, however, is a bit more interesting. The genus and species name for this animal, Lithobates palastris, translates to “one who haunts stones in the marsh,” an oddly spooky name. There is nothing ordinary and typical about the Pickerel frog. 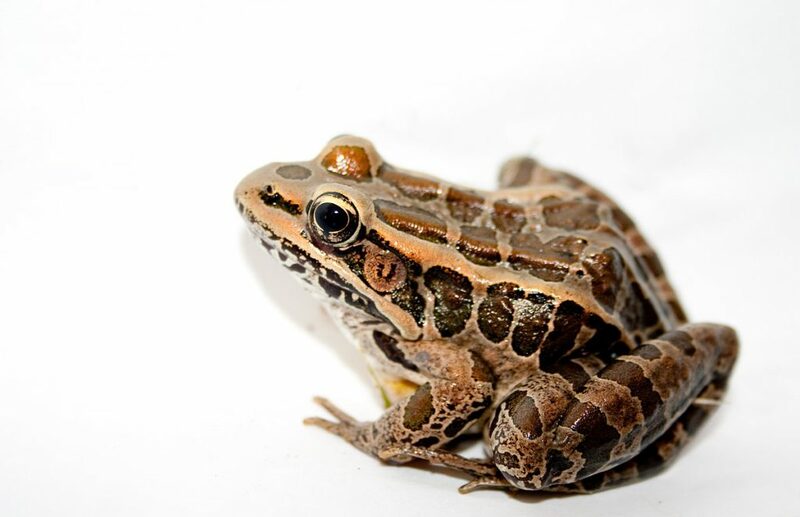 From its ability to produce poison secretions to keep it safe from predators to its ability to hunt with its mouth, not its tongue, the Pickerel frog exhibited some unusual adaptations that make this a one-of-a-kind amphibian that deserves a second look. Lee, Marisa. “Pickerel Frog.” Outdoor Alabama, Alabama Department of Conservation and Natural Resources. Web. 9 Jan. 2019. Galloway, Hazel. “Pickerel Frog.” Mountain Lake Biological Station, University of Virginia. 23 June 2019. Web. 9 Jan. 2019. “Pickerel Frog.” Animal Spot. Web. 9 Jan. 2019. Pickerel Frog image by Brian Gratwicke, cc-by-2.0. Modified with descriptive text by Insanitek.